In thinking about the long-term performance characteristics of the Knowledge Factor we were reminded of a quote from one of our favorite movies, “Christmas Vacation”. Readers who are familiar with this movie surely remember the scene in which Clark Griswold, played by Chevy Chase, having just received his “Christmas bonus” that was delayed in transit, opens the envelope in great anticipation to find a membership to the Jelly of the Month Club. To this news, the always tactful Cousin Eddie, played by Randy Quaid, aptly replies, “Clark, that’s the gift that keeps on giving throughout the entire year.” How right he was. With a big hat tip to Cousin Eddie for letting us barrow the phrase, the Knowledge Factor is the gift that keeps on giving throughout the entire [market cycle]. In other words, unlike the other simple factors, the Knowledge Factor can be used as a buy and hold strategy throughout any market environment. 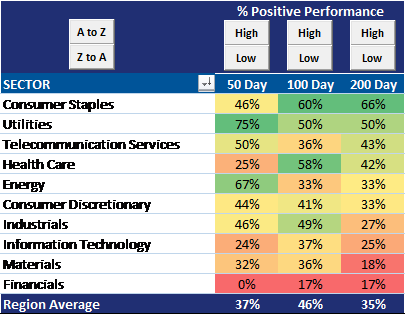 In a post earlier this week we documented how the Knowledge Factor has outperformed all the simple investment factors (size, value, momentum, quality, low volatility) and is far more consistent in delivering outperformance relative to the broad market to boot. 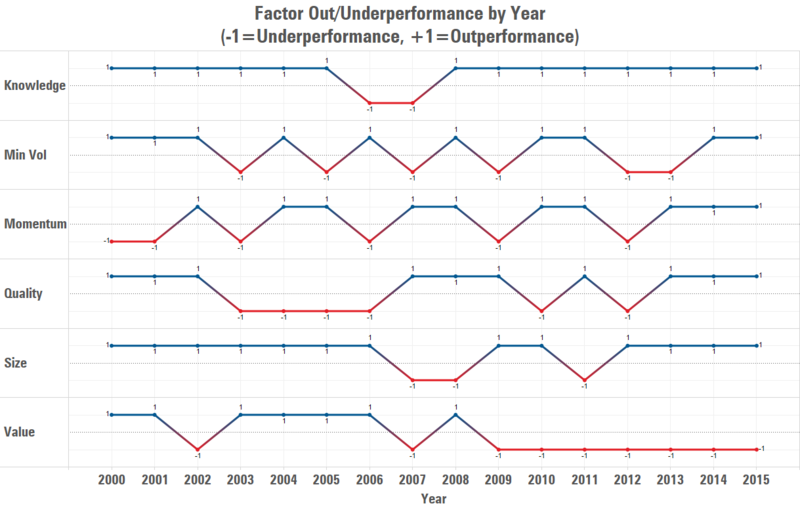 In that post we ran the first two charts below showing cumulative total returns since 2000 and the yearly outperformance hit rate of the Super Factor (the Knowledge Factor) and all the simple factors. 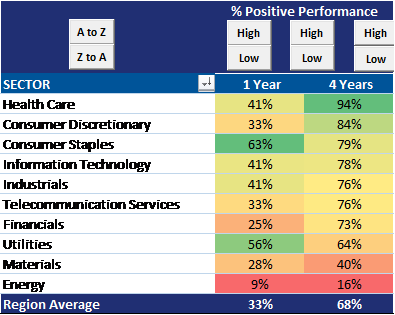 We see that the Knowledge Factor has outperformed the best performing simple factor by 89% and has an 88% hit rate of outperforming the MSCI World Index on a yearly basis. 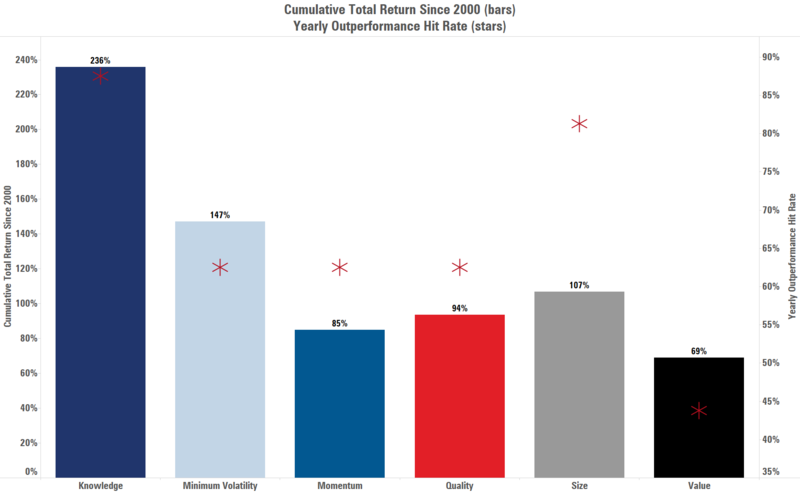 None of the simple factors have delivered consistent yearly outperformance. 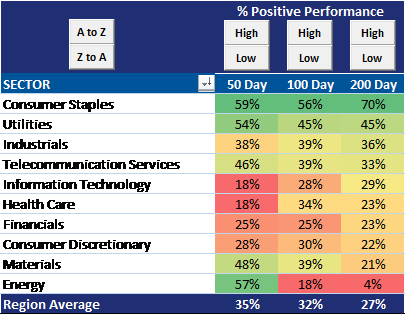 This is what we would characterize as consistent, systematic outperformance of an investment factor. It’s driven by the consistent, systematic mispricing of highly innovative companies. 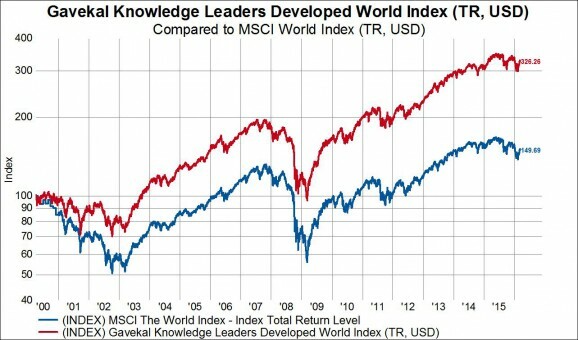 In the next chart below we’ll set the table a little bit and show that since inception of the Gavekal Knowledge Leaders Developed World Index (red line) in March 2000, it has outperformed the MSCI World Index (blue line) by 177% on a total return, USD basis. 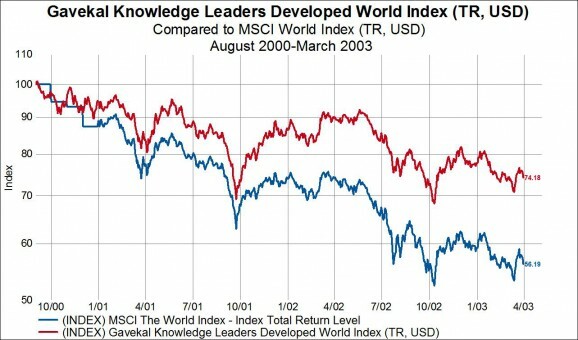 Next, we compare the performance of the Gavekal Knowledge Leaders Developed World Index to the MSCI World Index in the two bear market periods since 2000. In the 2000-2003 bear market the Knowledge Factor outperformed by 18% and in the 2007-2009 bear market it outperformed by 7.14%. 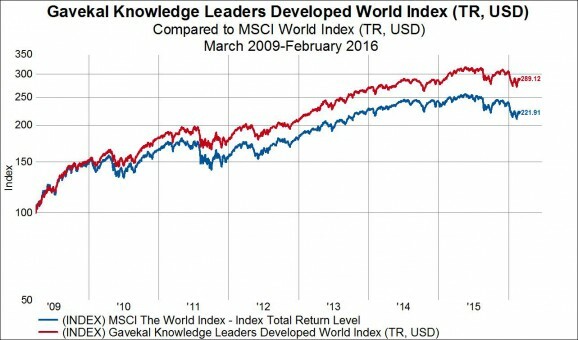 Here, we compare the performance of the Gavekal Knowledge Leaders Developed World Index to the MSCI World Index in the two bull market periods since 2000. 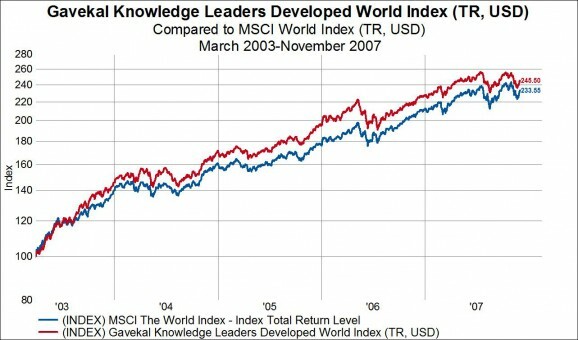 From 2003-2007 the Knowledge Factor was up 145% and outperformed the MSCI World Index by 12%. 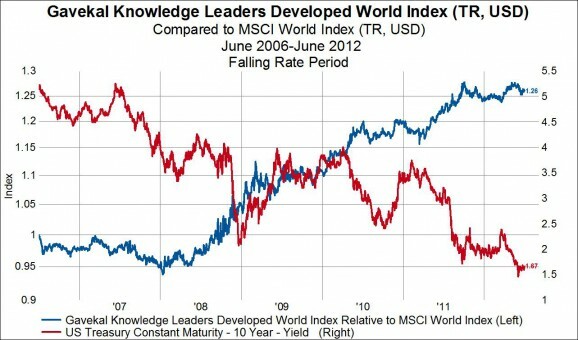 From 2009-present the Knowledge Factor is up 189% and has outperformed the MSCI World Index by 67.21%. How does the Knowledge Factor do in rising and falling rate environments? 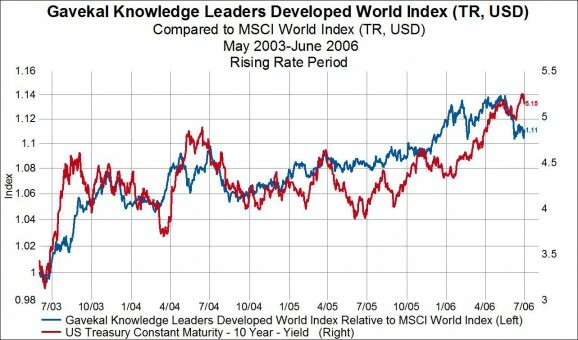 In the next charts we show the performance of the Knowledge Factor relative to the MSCI World Index (blue line, left axis) and overlay the US 10-year Treasury Bond yield (red line, right axis). When rates were rising strongly from mid-2003-mid-2006 the Knowledge Factor outperformed the broad market by 11%. When rates were falling strongly from mid-2006-mid-2012 the Knowledge Factor outperformed the broad global equity market by 26%. How does the Knowledge Factor do in rising and falling commodity environments? 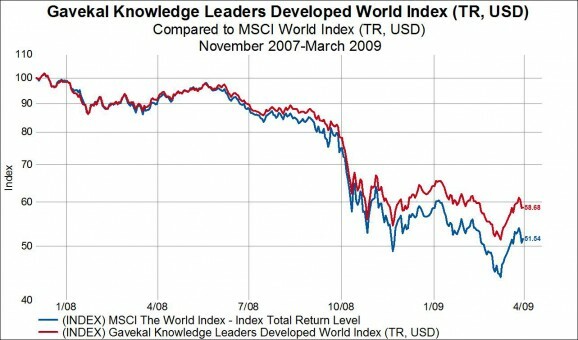 In the next charts we show the performance of the Knowledge Factor relative to the MSCI World Index (blue line, left axis) and overlay the Bloomberg Commodity Index (red line, right axis). 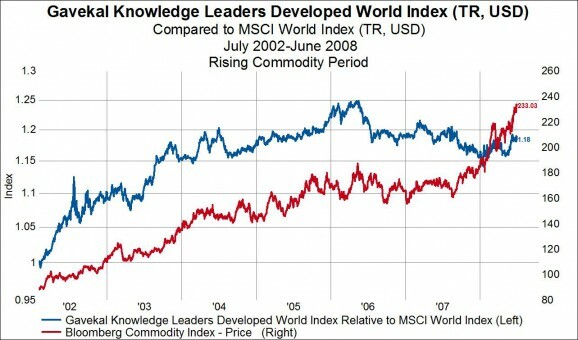 When commodities were rising strongly from mid-2002-mid-2008 the Knowledge Factor outperformed the broad market by 18%. 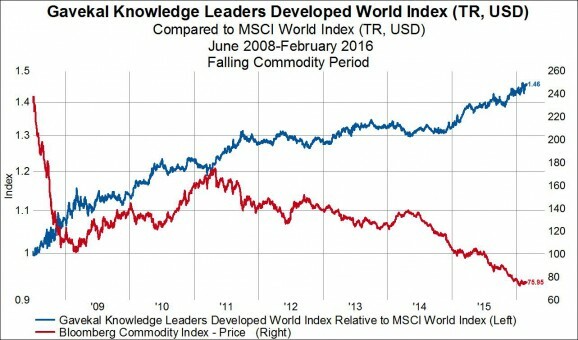 While commodities have been falling strongly from mid-2008-present the Knowledge Factor has outperformed the broad global equity market by 46%. How does the Knowledge Factor do in rising and falling inflation environments? 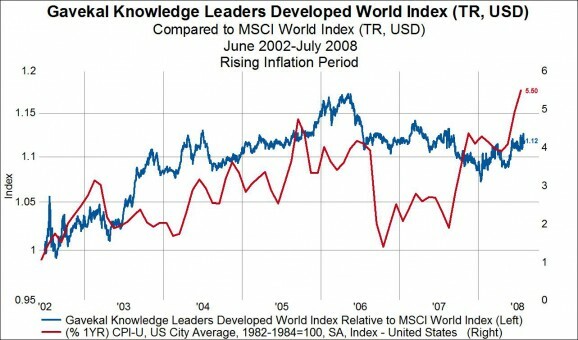 In the next charts we show the performance of the Knowledge Factor relative to the MSCI World Index (blue line, left axis) and overlay the US consumer price index (red line, right axis). When inflation was rising strongly from mid-2002-mid-2008 the Knowledge Factor outperformed the broad market by 12%. 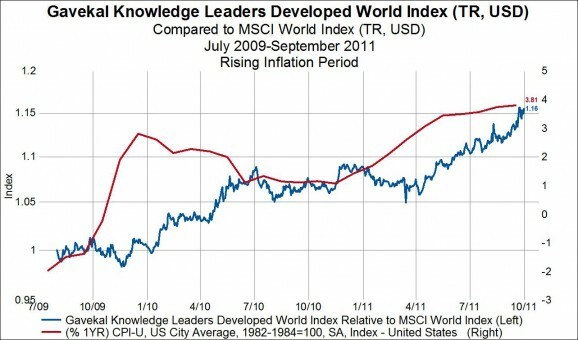 When inflation was rising again from mid-2009-fall 2011 the Knowledge Factor outperformed global stocks by 16%. 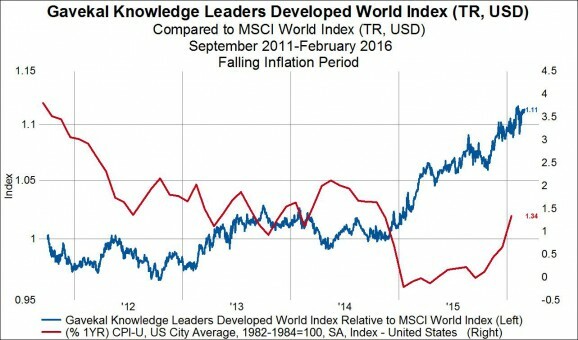 While inflation has been falling from fall-2011-present the Knowledge Factor has outperformed the broad global equity market by 11%. We can also examine performance from a bottoms up standpoint to show the systematic outperformance of Knowledge Leaders relative to non-Knowledge Leaders over all relevant time scales. In the tables below we show the percent of stocks by sector registering positive performance over various time scales for non-Knowledge Leaders and Knowledge Leaders. The bottom line labeled “Region Average” shows the aggregate percentage for each group. Over the last year, 43% of Knowledge Leaders have had positive performance vs only 33% for non-Knowledge Leaders. Over the four years, 81% of Knowledge Leaders have had positive performance vs only 68% for non-Knowledge Leaders. Over the last 50-days, 37% of Knowledge Leaders have had positive performance vs 35% for non-Knowledge Leaders. Over the last 100-days, 46% of Knowledge Leaders have had positive performance vs only 32% for non-Knowledge Leaders. Over the last 200-days, 35% of Knowledge Leaders have had positive performance vs only 27% for non-Knowledge Leaders. We can see from the above that the Knowledge Factor, the factor that tracks the performance of highly innovative companies, delivers superior performance in all types of market environments. This makes the Knowledge Factor a factor that can be employed throughout the entire market cycle and not just opportunistically, like the simple factors, which means it can be used as a buy and hold strategy in portfolios.